Phi Theta Kappa Graduation Cords are Royal Blue and Gold double cords. Honors Graduation carries royal blue and gold cords. Each cord of the double cord is 70 inches long including tassels from end to end, or 35" long if hanging around the neck, and ¼ of an inch thick. The colors of the cords are bright and vibrant. This is one high quality cord. One cord in the double graduation cord is a Royal Blue Cord,	the other is a Bright Gold Cord. The Royal Blue and Gold Double Honor Cord at Honors Graduation does not include the Phi Theta Kappa logo charm. There are cords available through Phi Theta Kappa's online store, but our cords are of the highest quality and are available at an amazing low price. In addition, we provide a single low flat rate for shipping, so you know your cords will get there quickly and for the best possible price. To order the Royal Blue and Gold Double cord just click on the button to buy now, then select royal blue as your fist color and gold for your second. Make sure that double is selected as your style or you will not be able to pick a second color for your gradation cord. 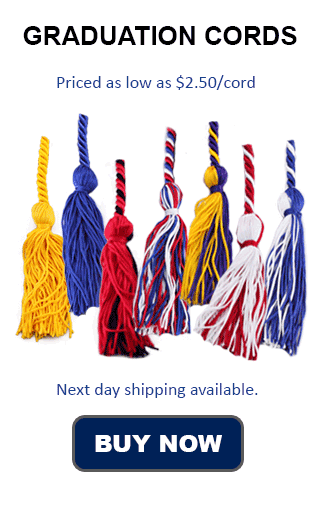 You can then choose the quantity of graduation cords you wish to order. We have bulk pricing at Honors Graduation, so the more cords you order the cheaper each cord becomes. Phi Theta Kappa is an honor society for two year colleges and institutions. It is an international honor society with chapters in countries around the world, including the United Arab Emirates, Peru, and Germany. In addition to Junior Colleges and Community Colleges, Phi Theta Kappa chapters and members are found in 4-year colleges that have associate degree programs. The official colors of Phi Theta Kappa are blue and gold, just like their honor cord that graduates can wear if they are members of this honor society. Phi Theta Kappa became a national honor society in 1918, and today it has over 1,200 chapters. The Phi, Theta and Kappa in Phi Theta Kappa stand for the words wisdom, aspiration, and purity in Greek. The White Rose is the official flower of PBK and its symbols are a golden key, Oak Leaves, Athena, and Laurel Leaves.